Learn everything you need to know about your 27 week old baby. Track important developments and milestones such as talking, walking, growth, memory & more. Your baby might soon choose her first real lovey -- a blanket, teddy bear, or other toy that she'll favor and drag around for years to come. 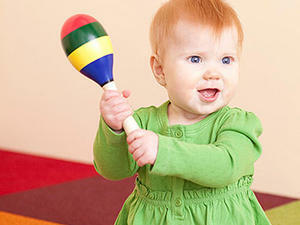 Experts call it a "transitional object" because it helps infants to bridge the divide between dependence and autonomy. Having one might help her sleep better, reassure her when you're not around, and offer comfort when she's afraid. Whatever she picks, try to buy several so you can wash one without depriving her of her friend, or replace it if it (eek!) goes missing. If the beloved is out of stock at the toy store, check eBay or other online sites. With a few backups, you'll avoid a sleepless night if the original is misplaced. Oddly, the more reassured your baby feels by your presence or that of a transitional object, the more daring she'll be in achieving physical milestones. At 27 weeks, your baby has probably been sitting up for a while, but she might no longer need to use her arms for balance now. Still, it's smart to surround your little sitter with pillows or a Boppy to cushion her if she falls; plus, the extra support will help her get stronger, so she'll be able to sit on her own for longer stretches. Over the next few weeks, your baby will grow comfortable enough in her sitting position to start twisting or reaching over to pick things up while seated. Then get ready for the next milestone -- reaching from a sitting position can pave the way to crawling. Your baby's mealtimes might seem like pure fun and mess, but your baby is actually learning from all that tasting, crumbling, squeezing, smearing, and throwing. Some of her experiments lead to fascinating results: that slippery foods such as bananas squish magnificently between the fingers, while dry foods, such as Goldfish crackers, just crumble. She's also discovering that if she throws her cup on the floor, someone will inevitably pick it up -- again and again. Such "games" can be frustrating to moms who simply want babies to eat, but they teach your little one how to feed herself and give her the confidence to do it, eventually, in a more focused, less messy way. Don't worry if your baby seems to eat like a bird at times. She's still getting the bulk of her nutrition from formula or breast milk, so if she hardly eats more than a few bites of baby food in one sitting, that's OK. In fact, babies are keenly in tune with their tummies, which are tiny to begin with. So you can trust her instincts when she pushes the spoon away or refuses to open up. When to worry? If you notice a significant change in the number of wet/dirty diapers she produces, if your baby seems irritable and lethargic for no apparent reason, or if she doesn't seem to be growing on schedule (most babies gain about a pound a month now, according to the American Academy of Pediatrics). If you're concerned, talk to your pediatrician. Separation anxiety is tough on your baby, but it can also take its toll on Mom and Dad, making you extra emotional about leaving for work, a night out with your husband, or even 20 minutes of errands. The best way to ride out this phase is to develop a parting ritual: Give Baby a hug and a kiss, hand over her lovey, then leave. The longer you drag out your departure, the harder it will be on both of you. So don't wait for her to stop crying. Instead, be confident that most babies quiet down and are perfectly fine about two minutes after you walk out that door. In the meantime, maximize the time you do spend together. To a 6-month-old, Mom and Dad are far better playthings than blocks or rattles, so develop a repertoire of games that you all love playing together. Hide behind the couch for a full-body game of peekaboo. Raid the kitchen and practice banging on bowl drums with long-handled wooden spoons. Or have a tickle-fest, with plenty of raspberries. You might be surprised to find that when she's spent some agreeable playtime with you, she'll be less fussy about letting you leave her behind for a little while. Talk to your baby all day long. Tell him what you are doing and what you see. This will build his emotional and social skills.